Over the last few years, we have had the privilege of teaching both Boy Scouts and Scout Leaders about archery. Whether in a Merit Badge class or a training session to ready volunteers to run archery ranges at various events and camps, my favorite aspect of the curriculum has always been about the history of archery. I think it’s important that young archers understand the depth and richness of the tradition they are entering when they pick up a bow. Archery truly has been the sport of man since the very earliest days. Arrowheads abound in ancient archaeological sites as old as the Upper Paleolithic Era. But the oldest true bow we know of rests in a museum in Copenhagen. Known as the Holmegaard bow, it was found in the peat bogs of Denmark and dates back to approximately 7000 B.C. Given its age, it is remarkable just how much it looks like a modern bow. Sixty-four inches long and made of dark elm, it would not look out of place at a 2017 traditional shoot. Once humans began keeping written records, it became clear that the bow and arrow were already established parts of daily life. No mere sport, archery was an important way to put food on the table and a valuable resource in warfare. We have records of Egyptians using composite bows in battle as early as 3500 B.C. And around 1200 B.C. Pharaoh Ramses II improved on their efficiency by putting archers in chariots, greatly increasing their mobility. At the same time the Assyrians developed a shorter, recurve bow which provided more power and easier handling. Samurai archers in feudal Japan called their art Kyūdō. The ancient Chinese developed crossbows as well as the more familiar recurve. The Parthians became famous for shooting backwards while on horseback. Native Americans dominated the plains with their bows and horses. No ancient civilization was without some form of archery. Archery developed independently on every continent. As a result, there are different styles of shooting, depending on where it began. The mechanics of launching an arrow from a string with a stick, however, mean that the actual equipment is essentially similar worldwide. There have been refinements and improvements over the centuries. 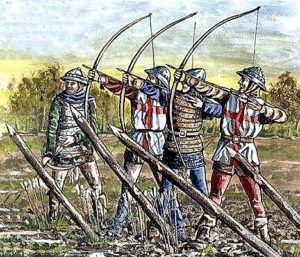 The British lengthened the bow considerably, and the English Longbow is famous as the weapon which won the Battles of Crécy in 1346 and of Agincourt in 1415. And in modern times we have seen the development of the compound bow in the mid-20th century. The advent of firearms led to the decline of the bow as a weapon of war, although some cultures such as the Cherokee and Comanche Nations and the Korean and Chinese military continued an important archery tradition. Archery saw the first stirrings of its revival as a recreational sport among the British upper classes in the late 18th and early 19th century. The Toxophilite Society was formed in London in 1781 under the patronage of George, Prince of Wales (later King George III). During this era it first became a sport popular with ladies. By 1879 it was popular enough in the United States that the National Archery Association was founded and held their first tournament in Chicago. The first archery club in the U.S., the United Bowmen of Philadelphia, was founded in 1828. Archery was briefly an Olympic sport, but was dropped after 1920 because each country had such widely differing rules there was no agreement how it should be conducted or scored. In an attempt to standardize the practice of target archery competitions, the Federation Internationale de Tir l’Arc (FITA) was founded in Paris in 1931, but it was not until 1972 that archery was again added to the Olympic lineup. Currently, archery is growing in popularity. There are different styles of bows- recurve, compound, and traditional- as well as different styles of competitions- target, field, and 3D- to name a few. Bow hunting has become discipline all its own. But all modern archery can trace its roots back to those original, ancient archers. When we shoot, we take our place with them in the grand tide of history. I have one correction for the author. The United Bowmen of Philadelphia was founded in 1828, not 1928.